Where in the World Is Chris Hodge? Lots of people in our industry are involved with charitable endeavors, but rarely do you hear of someone who makes it big and then gives up everything to help others. Chris Hodge is that guy. He spent more than a decade working up the ranks at The Norwood Group, eventually landing as Senior Vice President of sales for Barlow/Norwood. From there, he was president of Benchmark Industries for four years. Then, Hodge's wife, Maureen, was diagnosed with cancer, and she underwent several surgeries. "Her bad health really made us realize that life is short," he says. "So I quit my job to stay home with her until she got better and then the whole thing just took off." 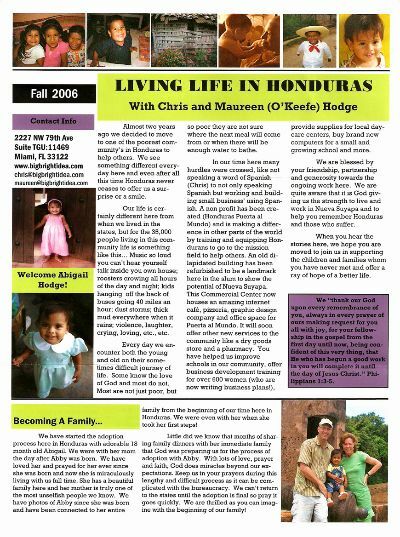 The two had planned to commit more heavily to charitable work later in life, but suddenly a new plan unfolded: living in the slums of Honduras. 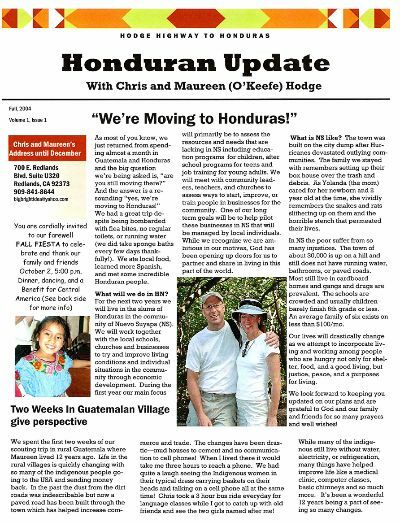 Two years ago, the couple headed to an impoverished community called Nueva Suyapa, just outside the capital city of Tegucigalpa.Their tin-roof dwelling does not have running water or a bathroom or sink inside the house, yet this former executive and his wife are gushing with a new level of satisfaction about life. One major source of happiness is Genesis Abigail ("Abby"), the daughter they are in the midst of adopting. They also derive great joy from seeing the impact their work is having in the area. Chris took his business know-how and created a plan to revitalize the ailing community, where more than 35,000 people do not have running water or basic services, and the average worker makes less than $100 a month. The vision is to create commercial centers the American equivalent of a strip mall which offer products and services, as well as a steady source of income for the community in terms of jobs and other benefits. The Hodges got the first development up and running with an Internet café and pizza restaurant. In true promotional style, they hosted a grand opening celebration, featuring music, balloons with prizes inside and free food samples. You can bet that was new for the town and about 500 people flooded the place to experience it. The work is riddled with challenges, particularly the fact that their lives are constantly at risk. The gangs in the area are notorious for harassing business owners and killing people who stand in their way; needless to say, the Hodges covet your prayers. Of course another way you can support them is financially. The Hodges continue to fund raise from their remote location for more projects to benefit the community. Current plans include opening a pharmacy and dry goods store in the building they've already purchased. They're also working with a local school to rebuild from the ground up the budget will be around $150,000 with the goal of providing a safe environment for the children to learn and grow. In addition, they've expanded their team to create training and opportunities for Honduran women who are struggling from domestic violence and severe poverty. 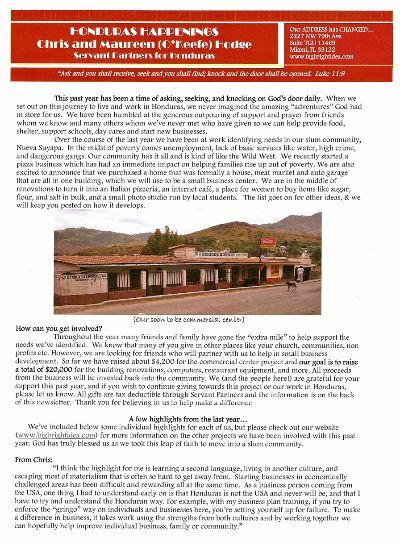 And a nonprofit they helped launch, Puerta al Mundo, has already sent out several Hondurans as missionaries to India, Brazil and North Africa to help revitalize those communities. Currently, the Hodges are planning on another year or two of service, although they've learned to be extremely flexible when it comes to life and making plans. Chris does anticipate returning to Corporate America one day, but acknowledges a renewed resolve that "business has the responsibility to help the world around them." 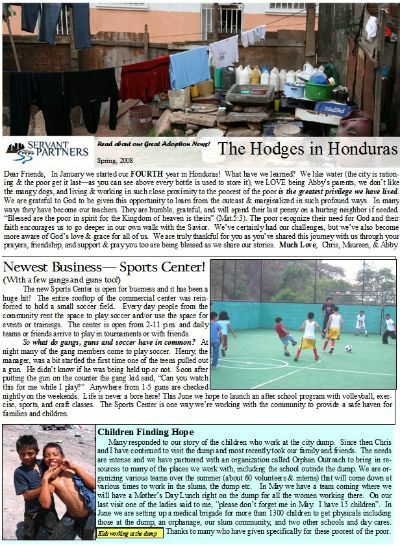 For more information and pictures about the Hodges' grand undertaking, visit their Web site, www.bigbrightidea.com . 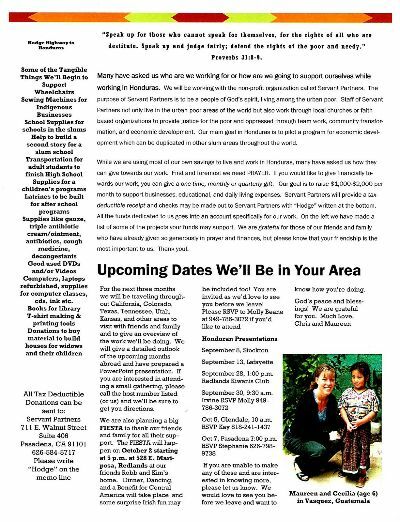 All donations are tax-deductible and can be made through their sponsoring organization, Servant Partners ( www.servantpartners.org ). 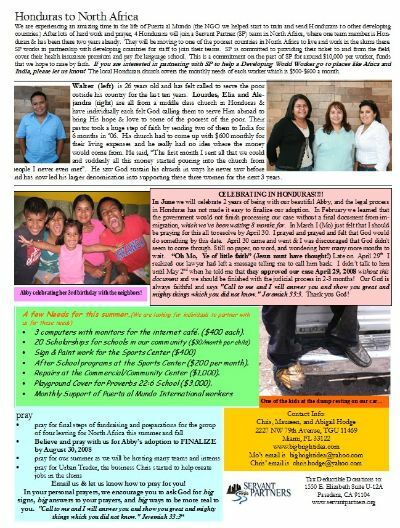 Donations earmarked for the Hodges are deposited directly into their Honduran account. "The things we see down here on a daily basis are really more than I can describe in an e-mail," writes Chris. "It is tough when people are starving around you. Everyone that comes down to visit us leaves with Honduras on their heart, and the trip changes their perspective on what is really important in life." 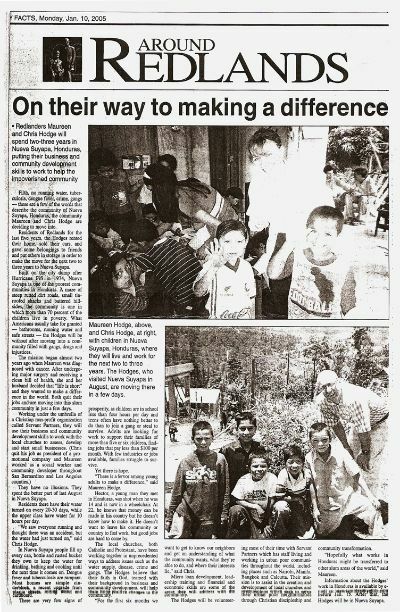 Newspaper article from the Redlands Daily Facts about our departure to Honduras.